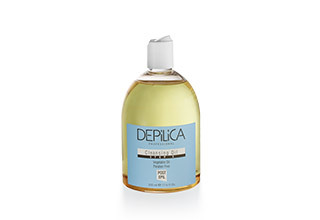 Luxe wax epilation procedure with black truffle extract developed exclusively for Depilica Professional for those cases when it is necessary to offer something special to the client transforming epilation into luxurious body spa. Luxury of the procedure is in the product itself. The extract of the product is in wax. Black truffle is considered to be the pearl of the Old World. It is the most expensive mushroom in the world, as well as the most effective cosmetic ingredient. Its extract is the source of vitamin B which exercise regenerating and invigorating action and that is why it is excellent way to preserve skin youth. All the products of “Black Truffle” line have moisturizing action, rejuvenate, restore skin protection functions, promote regeneration of damaged cells, and improve microcirculation. Apparent advantage of black truffle extract in epilation procedure is its ability to inhibit hair growth. 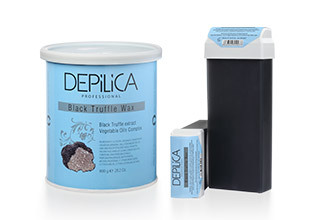 Wax with black truffle has translucent texture and beautiful creamy black color. To prepare and purify the skin before the procedure it is recommended to use Cleansing Lotion (Step 1) from the Base line. To remove wax remnants and tack right after epilation base product Cleansing Oil (Step 3) can be used. Unintrusive fragrance with soft and harsh note will emphasize delicacy and chic of the procedure due to which skin becomes faultlessly smooth and silky. Aesthetes, gourmets, and niche products amateurs will certainly see value in stylish deluxe skin care.